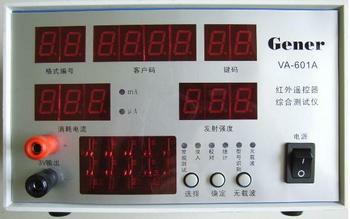 The va-601a ir remote controller analyzer is very powerful professional testing instruments for ir remote controller. It integrated many functions such as the ir code reader, current meter,3v DC power supply and signal emission intensity testing, etc. It can examine all kinds of the ir remote controllers for DVD/VCR/TV/fan/stereo/computer/stb, etc. It is the best helper for the remote controller producers, franchisers, designers, maintainers and the agents of the remote controller chipsets.